$1,000 Fish-A-Thon fish Caught on FIRST DAY! Congratulations! …to Phoebe Herbster, Omaha, NE who caught the “Con Kid” on the 1st day of the WLA Fish-a-thon. The Concordia, KS businesses that donated $100 each toward the $1,000 prize include: Fleming Const., Fastenal, Eco Water, Blackwood Chiropractic, Krier Mower/Electric, NCK Community Laundry, KansasLand Tire, Miller Automotive, Liesler Carpentry/Const., and Mikesell Tree Shearing & Hedge Post. 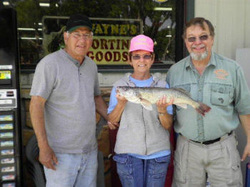 L-R Harv Harbin, Omaha, Phoebe Herbster (holding the winning fish), Omaha and Wayne Ronnebaum from Wayne’s Sporting Goods, Glen Elder. Roger Hardway, Concordia, KS, Vice-President of the Glen Elder Dam/Waconda Lake Association, presenting the $1000 to Phoebe on behalf of the Concordia businesses. 13th Annual Catfish Tournament The Glen Elder Dam / Waconda Lake Association's 13th annual catfish tournament was held Saturday, August 11 with 13 teams participating. Only 5 fish were figured in for the total fish weight. 1st place team with 41.15 lbs of fish and winning $130.00 was John Stoeber, Jewell and Mike Stoeber, Salina. 2nd place team with 34.45 lbs and winning $65.00 was Matt Loomis and Colin Loomis, Mankato. 3rd place team with 32.25 lbs and winning $39 was Hunter McMillen, Solomon and Jim Loomis, Wichita. 4th place with 27.78 lbs, winning $26 was Bill Loomis, Jewell and Fred McMillen, Wichita. There was also a Big Fish Contest with every team participating. The winner was Colin Loomis, Mankato winning $130 for his 13.66 lb fish. Chairman of the event was Cecil Miller, Cawker City. The 3rd Annual Glen Elder Dam/Waconda Lake Association's Crappie Tournament was held Sunday, May 6, 2012. 13 teams participated. 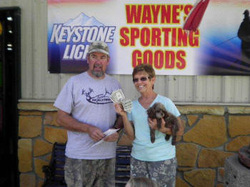 1st place team was Roger and Tina Hardaway of Concordia, KS winning $130.00 with 18.86 lbs. 2nd place was David Gieber and Nathan Gieber, Concordia, winning $65.00 with 17.22 lbs. 3rd place went to Gilbert Specht, Downs, and Cecil Miller, Cawker City, winning $39.00 with 17.12 lbs. 4th place went to Scott Waters, Beloit and Frank Burwell, Concordia, winning $26.00 with 16.38 lbs. The Biggest Fish Contest was won by Roger and Tina Hardaway, Concordia, winning $120 for a 1.84 lb crappie. Chairman for the event was Roger Hardaway, assisted by Janice Miller. The Waconda Lake Association was proud to host lunch for dozens of youth who participated in this year's Waconda Lake Youth Fishing Tournament and Youth & Women Hunting Tournaments, both are annual events sponsored by the Kansas Dept. of Wildlife & Parks. Thank you to everyone who helped with the establishment and refreshing of the man-made, underwater fish habitat brush piles scattered about the shores of Waconda Lake.